Posted March 5, 2018 by Jenna & filed under KidLit Coffee Talk. I’m so excited for today’s edition of KidLit Coffee Talk! With me today is the prolific Leslie Bulion, author of children’s fiction and science poetry. I first met Leslie back in 2015, when she was doing an author visit at my children’s school. She helped propel me on my writing journey, as she was the first person to tell me about SCBWI. 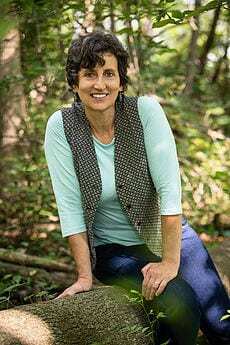 Now, three years later, I’m lucky enough to be chatting with her about her newest poetry book, Leaf Litter Critters. 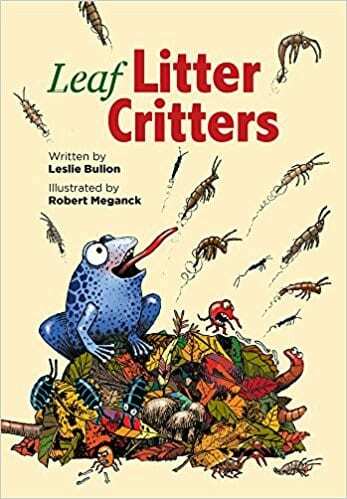 Leaf Litter Critters was released on March 1st, 2018 with Peachtree Publishers and was illustrated by Robert Meganck. Thank you for joining me, Leslie! What kind of coffee do you like to drink? Thanks for this lovely opportunity to chat over coffee, Jenna! I have my cuppa right here *sip*. As a critter-lover, I opt for organic, fair-trade and shade-grown coffee with notes of smooth chocolate and flowing manuscript. I drink herbal tea all afternoon—ginger, especially. This could be a very long answer! The short(er) of it is that I didn’t always know I wanted to be a writer, but I have loved studying science and nature as long as I can remember and I’ve been writing poetry since the fourth grade. Beyond that, my educational and professional experiences have taken some random twists and turns that, in light of what I do now, seem almost purposeful. Your love of nature certainly shines through in your poetry. Tell me about your newest poetry book, Leaf Litter Critters. Leaf Litter Critters is a whole ecosystem hidden inside funny science poetry collection. I take readers in for a closer look at the “brown food web” – the decomposers and recyclers (most are very tiny!) that return nutrients locked in dead plants and animals back to the soil, making the nutrients available to green plants—the primary producers in the green food web. The fun is magnified a thousand-fold with Robert Meganck’s brilliantly humorous illustrations. What was the most exciting part of the publication process? What was the hardest? For this particular collection, the most exciting and the hardest part of this book was creating the relative size chart in the back matter. I met retired school library media specialist Terry Young at NCTE a while back, where Peachtree Publishers was sharing a taped-together printout of Leaf Litter Critters. Terry advised adding visuals to my textual size descriptions, to give readers a better idea of the relative sizes of these mostly unfamiliar critters. Making this happen months later involved 11th hour, back-and-forth flying pdfs with Robert Meganck during an all-day bus ride because I’d been unavailable, out of the country on a research trip. The bus’s wifi cut out and I hit “send” minutes before my phone’s battery died. I was thrilled to see that element highlighted by the Kirkus reviewer. Wow, that sounds stressful! And congratulations on the starred review in Kirkus! What else are you working on? I’m working with my editor on final tweaks while Robert M. finishes up the illustrations (can’t wait to see the cover!) for my next funny science poetry collection, Superlative Birds (Peachtree: March 1, 2019). I’m also putting the final touches on a new manuscript about amphibians, planning a bunch of school visits, and getting ready for my Leaf Litter Critters book launch party at the Durham Library on March 14th—games, critter cookies, a sing-along—come on down! I have two more science poetry manuscripts in the pipeline as well. Critter cookies? Sounds yummy! What is your favorite part of being a published author? I always let students know that “favorites” are the hardest questions for me! Let’s see…visiting with students and seeing how deeply they care for our incredible planet Earth is a huge favorite…reaching out to scientists who love to share their work is super-fun…the hands-on field work I do…playing with words and ideas—I feel so fortunate for the opportunity to do all of this. What’s one picture book you loved when you were little and a more recent one you love now? I’m sure A.A. Milne’s poetry collections: When We Were Very Young and Now We Are Six have had a tremendous influence on my work. I love so many books now that I can’t pick just one—you know—favorites are so difficult! Yes, they are! What are you currently reading? I just finished a brilliant YA graphic novel in verse about the life of Frankenstein’s creator, Mary Shelley entitled Mary’s Monster, written and illustrated by Lita Judge. I’m now reading Three Floors Up by Eshkol Nevo, written for adults. Even though I studied oceanography for years, love to be in and on the ocean, and SCUBA dive every chance I get, I am VERY prone to seasickness! Thanks so much for taking time out of your busy schedule to chat with me! Great chatting with you here, Jenna! You have the chance to win a copy of Leslie’s book, Leaf Litter Critters. To enter this giveaway, simply comment on this post. A winner will be chosen at random on Sunday, March 11th. And don’t forget to subscribe to my blog. Good luck! I love both poetry and nature so this sounds like a cool book. Thanks so much for doing this interview. I love poetry collections for kids and look forward to reading Leslie’s work! I’m also a kid lit writer and poet and nature lover. I see you both live in New England too–I’m in New Hampshire–a bit farther north (and colder) than CT. I’m sure you’ll be seeing spring arrive before I do! But winter is great for writing time, isn’t it? Thanks, Linda! Yes, I love writing when it’s snowing out and I’ve got a fire roaring in the fire place. What a unique idea. I would love to hear more about the challenges you faced as you put this manuscript together and how you met them. Very interesting post. I will definitely be on the look-out for Leslie’s books. I love the poetry and NF that hers seem to have! Can’t wait to read Leaf Litter Critters. What a fun title! LEAF LITTER CRITTERS sounds amazing. I look forward to reading it! I love, Love, LOVE the idea of your book! I just returned from a hiking trip through parts of panama where I got the chance to watch and learn from the leaf cutter ants. They’re FASCINATING! I love poetry and rhyming stories. Best wishes for HUGE success on your works! Wonderful interview! I’m looking forward to reading Leaf Litter Critters, and the book launch sounds fun – hope everyone has a fantastic time. Now to the important stuff- what’s the Critter cookie recipe? Ha! Thanks for all of these lovely comments, poetry and nature lover-friends! Huzzah for your critter cookie party, Denise! Raven, I used a regular (lots of) butter cookie recipe, made the dough (white, organic flour because whole wheat does not cooperate with me for fancy cookie-cutting), but here’s my hot tip: I rolled it out on parchment and THEN refrigerated it on a cookie sheet instead of rolling out after refrigerating. Worked like a charm. I wonder why no recipes ever suggest this? So fun! Cheers, everyone! DianaLynn–I LOVE those leaf-cutter ants, too!